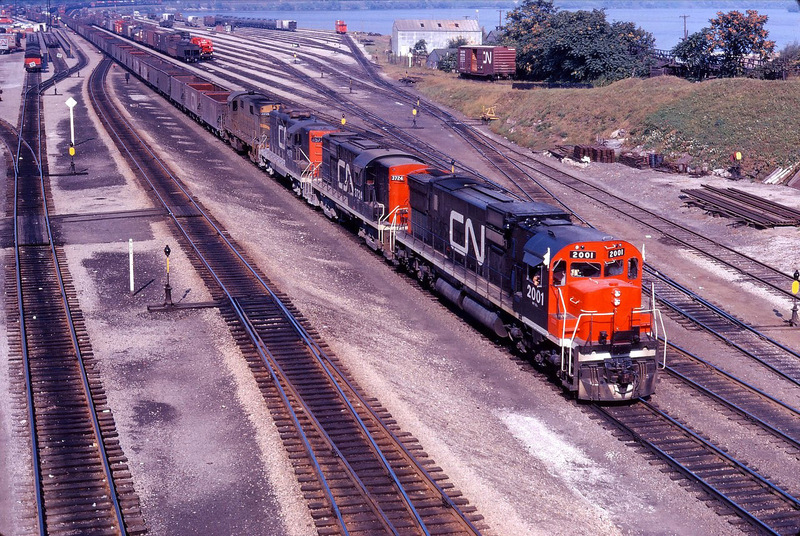 Railpictures.ca - Doug Page Photo: In addition to the “Dofasco” ore train, CN occasionally ran ore trains to points in the United States through Hamilton and Fort Erie. (Perhaps another member can comment on how often such trains ran and their destinations.) In any case, this train has a nice consist of new C630m 2001 (delivered in August! ), as well as RS18 3724, GP9 4573, and RS18 3859. | Railpictures.ca – Canadian Railway Photography – photographie ferroviaire Canadienne. Copyright Notice: This image ©Doug Page all rights reserved. Caption: In addition to the "Dofasco" ore train, CN occasionally ran ore trains to points in the United States through Hamilton and Fort Erie. (Perhaps another member can comment on how often such trains ran and their destinations.) In any case, this train has a nice consist of new C630m 2001 (delivered in August! ), as well as RS18 3724, GP9 4573, and RS18 3859. That is correct. Ore from Marmora, Ont to Bethlehem Steel, Lackawanna NY. Began Dec 17/73 and moved until Apr 30/74. Trains were U873 and U872 (empties returning). Each train was 48 cars and normally had a pair of ICC-clearance GP9′s. Delivered to E-L at Black Rock, who then delivered to the South Buffalo Rly. Since Marmora was a Bethleham Steel-owned mining operation, I can only presume this one-time 5 month move was due to problems with the normal method – lake freighters. Marmora closed in 1978 insofar as ore production was concerned. The other reason for the trains could have been a lack of stockpiling leading up to that winter season. Jakob, that car on the grade is lumber for Acorn Lumber who had a spur there; it was removed sometime in early 1970s. Bruce, I read somewhere that CN also handled ore trains for Lackawanna, NY over the Grimsby sub. Any idea how often they ran? 449 and empties 450 were near-daily moves. It was pellets from Dane Ont to Aliquippa Pa. At Fort Erie the train was handed over to NYC/ PC for the trip to the steel mill. This photo is a real Gem for Hamilton fans. Thank you Doug for capturing this. Wouldn’t surprise me if there was a lumber dealer there, and that boxcar is spotted for unloading. Fantastic shot – photos from the Bay street bridge before the yard was reconfigured are fairly rare so this is a real treat. Thanks for sharing.